Get excited about pool fitness! Water exercise not only offers an array of healthy lifestyle benefits and quick physical results, but it also provides new and innovative ways to incorporate routine exercise into your day. Well, if you stick with it, you’ll see an increase in muscle strength, flexibility, and endurance. You will discover a fun way to burn the max amount of calories in a shorter amount of time, all while reducing the negative impact that dry land exercise has on joints. Pool exercise has more benefits than strength training. 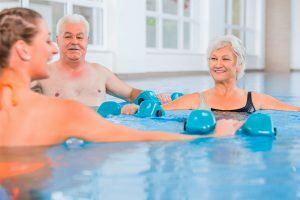 Water aerobics has been shown to reduce blood pressure by enabling “one’s blood flow to circulate more effectively throughout the body, effectively decreasing blood pressure and decreasing resting heart rate.” All in all, water exercise is a safe, effective, and enjoyable way to get in shape. Now that you’re pumped up for some water fitness, it’s time to transform your pool into a gym! Before beginning to design your water routine, it’s important to note what you enjoy and what you don’t. One of the greatest reasons why exercise fails is the lack of enjoyment in the exercise. If you don’t like to run, then don’t run. If you hate weights, then don’t lift weights. There are always a plethora of alternative options. And this is no different for water exercise! If you’re on a budget or hate using equipment, try some non-equipment water exercises. If equipment is your thing, you can create an entire underwater gym. If you’re the type that enjoys meditative exercise, try laps with a jet-propulsion system. Keep it Simple: No Laps, No Equipment! Most people imagine pool exercise consisting of hours of mind-numbing laps. Laps are the equivalent to running. Innovation and diversity is tightly restricted to speed and breaststroke which leads to repetitive boredom. So, it’s not for everyone. On the other hand, buying exercise equipment can be expensive. Here are some alternative exercises that are just as effective, yet avoid the monotony of laps and the expense of equipment. The double leg lift is a great warm-up exercise! Place your back against the side of the pool and extend your arms over the edge to each side. Mimic the shape of a lower case “t”. Press your legs together, from the thighs to the ankles, in essence creating a “mermaid tail”. This helps activate the muscles throughout the legs and into the buttocks with less mental effort. Lift and lower your legs slowly. Make sure to keep your legs pressed firmly together. This exercise provides a double challenge as you push against the weight and movement of the water while also fighting against your body’s natural buoyancy. It’s as simple as it sounds! The depth of the pool is important for this one. Make sure that you are able to stand with your head out of water, yet the ground is at least two feet away when you tread water. Place your back against the side of the pool and rest your elbows on the edge. If you don’t have access to the pool edge, you can alternatively use a pool noodle or float device. Lean back and kick your legs out in a circular motion, imitating the action of bicycling. Dry land cycling is an excellent workout for the legs, buttocks, and abs. Performing this same cycling action in the water increases the burn in all those areas! Once again, depth plays a key role in the underwater jumping jack. Find an area in the pool that is far away from the edge and where the water stops between your hip and belly button region. In the beginning, perform the jumping jack just as you would on dry ground. Jump out and land, then jump again bringing your feet together and down. Once you’re comfortable with the motion, incorporate your arms. Your hands should always be in the water to create resistance. For more of a challenge try the half-suspended jumping jack. This time jump your legs out and find the ground. When you jump to bring your legs together again, try not to let them touch the ground before pressing back out into a triangle again. This is a great way to work your core as you work against and with the natural buoyancy of the body. The flutter kick incorporates a similar benefit gained through laps without the need of a lap pool. Face the side of the pool and grasp the edge with both hands. Make sure that your arms are shoulder distance apart and keep a comfortable bend at your elbow. Let your body gain its natural buoyancy. Once your legs have leveled with the top of the water begin kicking up and down. Avoid bending your knees too much and keeping your legs completely straight. Begin with slow movements and increase as you become comfortable. There are those that hate equipment and there are those that can’t exercise without that extra appendage. It may sound like an awkward or difficult task to incorporate equipment into a water exercise routine, yet it’s quite simple and can be fun. Some water equipment can also double as pool toys as well! For those that practice water exercise exclusively, it may be worth it to look into an exercise system. While this sounds complicated, it’s actually extremely simple. Yet, a stationary swimming pool system allows the user to perform a higher range of exercises. Basically, this type of system tethers you to the side of the pool. It allows for a completely natural motion and the difficulty can be increased simply by adding weights to the ankles, wrists, or waist. This system should be exclusively used for active athletes, therapeutic exercises, or seasoned water exercise users. Generally, these are self-contained systems that pump water into the pool to create a current that pushes against the user. This system is a great way to turn a small pool into a lap pool. They are also amazing for intensifying any of the exercises listed above.